Sani Ibrahim Charlie Azar is installed as bishop of the Evangelical Lutheran Church in Jordan and the Holy Land on Jan. 12, 2018 at Redeemer Lutheran Church in Jerusalem’s Old City. 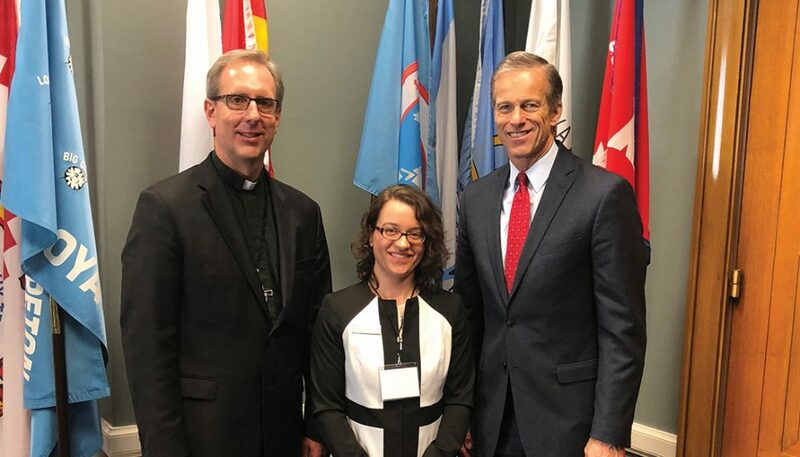 Randy Gehring (left), pastor of Our Savior Lutheran Church, Sioux Falls, S.D., and Crystal McCormick, candidacy and mobility office coordinator for the South Dakota Synod, met with Sen. John Thune, R-South Dakota, on Jan. 23 as part of the ELCA World Hunger Leadership Gathering in Washington, D.C.
Sani Ibrahim Charlie Azar was installed Jan. 12 as bishop of the Evangelical Lutheran Church in Jordan and the Holy Land (ELCJHL). Azar is the denomination’s fourth bishop and previously was pastor of the Evangelical Lutheran Church of the Redeemer in Jerusalem for 30 years. 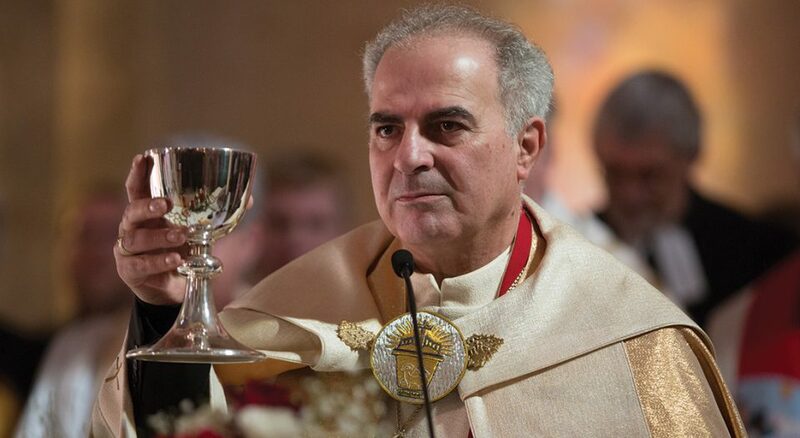 He succeeds Munib A. Younan, who had served as bishop since 1998. “I am humbled and honored to take up this new responsibility and promise to continue our relationship based on love, companionship and respect,” Azar said. This year’s “God’s work. Our hands.” Sunday will be Sept. 9. The day is recognized within the ELCA as an opportunity to celebrate our identity as one church, freed in Christ to serve and love our neighbor. Access resources to guide your congregation’s planning, promotion and more at elca.org/dayofservice. ELCA congregations and individuals are invited to participate in “Act Now: Unite to End Racism,” an initiative of the National Council of Churches (the ELCA is a member) held April 3-5, in Washington, D.C. Events will include a rally on the National Mall; an interfaith service at the Lincoln Memorial; a time of commitment at the National Museum of African American History and Culture; and a day of advocacy on Capitol Hill. The draft of the ELCA policy statement “A Declaration of Our Inter-Religious Commitment” was released Jan. 12 for a public comment period. The ELCA Inter-Religious Task Force will receive feedback with a response form through June 30, and then will revise the draft accordingly before it goes to the ELCA Church Council for possible recommendation to the 2019 Churchwide Assembly. Presiding Bishop Elizabeth Eaton announced at the 2016 Churchwide Assembly that she had appointed a task force to develop the draft. In January, Lutheran leaders from across the country met in Washington, D.C., for the annual ELCA World Hunger Leadership Gathering, where they addressed the impact of hunger in communities. The event took place as lawmakers began discussions on reauthorizing the Farm Bill, which sets agricultural, conservation, energy, rural and hunger policies. On Jan. 23, hunger leaders met with members of Congress and their staff to urge support for a strong 2018 Farm Bill. The Salvadoran cross created for the Joint Catholic-Lutheran Commemoration of the Reformation in Lund, Sweden, in 2016 was placed in the chapel of the Ecumenical Center, home to the Lutheran World Federation in Geneva, Jan. 18. The cross was received by Olav Fyske Tveit, general secretary of the World Council of Churches, in a dedication service. “May the historical step that [the cross] symbolizes remind us that Christ’s cross transforms our conflict into communion,” Tveit said. Listening is central to advocacy. Attention to diverse voices brings in the variety of experiences and perspectives that reflect the complexity of today’s world. In creating public policy, exchanging views helps us discern merits and shortcomings in positions, including our own. In this spirit, ELCA Advocacy staff accepted the invitation from bishops in the three Dakota synods for several days of listening. They met with farmers, ranchers, farm loan bankers and hunger ministries. They toured a coal mine, land reclamation sites, a coal gasification plant and a rural energy cooperative. North and South Dakotans shared their commitment to be good stewards of creation. They expressed concerns about rural poverty, the negative impact of some regulations on local economies and the importance of subsidies for farmers and federal hunger programs. Some said they felt dismissed by their church as a “flyover state” and disregarded when they didn’t see concerns about rural issues or their economic reliance on fossil fuels reflected in ELCA Advocacy positions. Advocacy staff listened and committed to continue in relationship to discern God’s will for the public voice of the church. The Prayer of St. Francis asks that we “may not so much seek to be understood as to understand.” Informed by relationships in the Dakotas, a just transition from fossil fuel is taking new prominence in addressing climate change. Messaging and advocacy on the 2018 Farm Bill will focus not only on nutrition programs, but also conservation and support for farmers. ELCA Advocacy looks forward to opportunities for future listening sessions around the country.